Editor’s Note: This article was first published by RepublicReport.org. By now, most Americans realize that Big Money is a powerful force in American politics. Members of Congress often shy away from regulating an industry that showers them with campaign donations. Members will rush to vote for massive subsidies and giveaways to big donors. 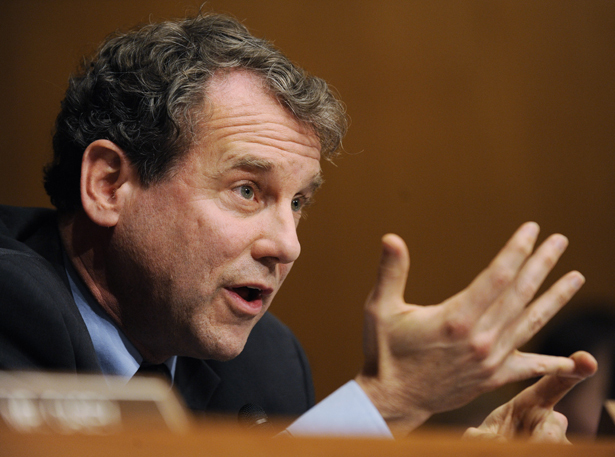 One senator who has been mostly unmoved by the presence of this Big Money is Ohio Senator Sherrod Brown (D-OH). He has been a leader in taking on the big banks, working to create a more just and humane healthcare system, and kicking Big Money out of politics. THE BANKS: Brown has been a tough advocate for fixing the financial system that brought the world to the point of economic catastrophe in 2008. He authored the Brown-Kauffman amendment in the Senate during the financial regulation debate. The amendment would’ve effectively broken up the biggest banks, but failed to pass a Senate vote. The Chamber is funded by banking entities like Citigroup and New York Private Bank & Trust. THE HEALTH INSURERS: During the debate over legislation to reform the American healthcare system, Brown was a leader, advocating for a public plan for Americans to buy into at least, if not a Medicare for All system that completely cuts out private insurers. Health insurers from America’s Health Insurance Programs used the Chamber of Commerce to secretly funnel tens of millions of dollars to attack health reform efforts, and their money is now likely going to be used to attack Brown for being a leader in holding their industry accountable. THE DRUG COMPANIES: The American drug industry has a pretty good deal. They use their political clout to get massive funding from the government, then they use their political clout to bar Americans from reimporting drugs from countries where they are cheaper, like in Canada. Brown didn’t think that was right, so he voted for a measure that would’ve allowed Americans to purchase drugs from other countries. Chamber donors like Eli Lilly and Merck are likely very unhappy about Brown standing with Americans and free market advocates over their companies. THE OUTSOURCERS: Support for corporate-written “free trade” agreement that hollow out our manufacturing base and reward human rights abusers overseas has become vogue among bipartisan elites, but not Brown. He opposed the agreements made with South Korea, Colombia and Panama. The Chamber has countless outsourcing-backing corporate members who supported these agreements, including Eli Lilly, Microsoft, Intel, 3M and others. It’s important for the voters to understand that these advertisements are not simply coming from concerned citizens. They are being financed by America’s top corporate front group, which is being used by corporations to lash out against one senator who worked very hard to hold them accountable. If Brown is defeated, it will send a clear message to other senators willing to challenge Big Money: if you stand up to us, we will make sure you’re unseated. But if Brown wins, there’s at least a chance that we will see more senators willing to take politically courageous stands in the future. Zaid JilaniZaid Jilani is Commuications and Outreach Coordinator for United Republic. He is the former Senior Reporter-Blogger for ThinkProgress. His work has also appeared in outlets including Salon and the Atlanta Journal-Constitution.